Facebook has decided to change the playing field again with Timeline for Facebook Pages. At first you’re thinking, “Crap! Now I have to do everything all over again!” – But have no fear, your page still works. Let’s just take a look at the features and what you can do now that you couldn’t before. Cover photo now available(851px x 315px): Great space for advertising on your page. Profile photo is now a square instead of the long rectangle: This is great because your profile image will be the same in news feeds as well. No more fiddling with thumbnails. You can now add custom thumbnails for your apps to help match your page layout: You no longer have to settle with the app creator’s choice. Custom tabs are now larger (749px wide): Having more real estate is always good! Status updates are now sticky: Keep your most important updates up top for seven days. The default landing tab option is no more, everyone lands on the wall tab by default. Profile images are s small square now (124 x 124) and they sit inside the cover photo area. The photo strip up top is no more. The tabs are no longer on the left side, but up top instead. You may or may not like the features that were removed, but in my opinion it’s all good. The fact that we are given more real estate to work with on custom tabs, as well as that nice huge cover photo makes up for it. Facebook nation will figure it out eventually, it always does. Facebook Timeline for Pages will be rolling out live come March 30th, 2012. This gives you a nice thirty days to figure out your new layout, preview it and publish it early if you choose to. How Do I Preview The Page? Facebook will allow you to go ahead and make changes to you page in a live preview (only available to admins) before the official launch date. Take advantage of this and get ready. Simply visit your page and click on the ‘preview’ button up top. How Do I Publish The Page? While you are in preview mode, you will see the option up top giving you the option to publish your page once you are ready to go. There is a new admin area for you to get acquainted with in order to make updates to your page. It’s conveniently located to the right of the cover photo above the mini-timeline. 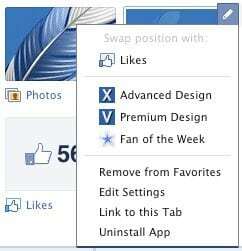 The beauty part is that you no longer have to leave your Facebook page in order to make changes. The admin panel slides down and all of your options are right there in front of you. How great is that?! After you’ve entered the admin area, click on the ‘Manage’ button and you will see the ‘Edit Page’ button. This will get you to the area you know and love in order to edit specific details about your page. You can have up to four showing at one time, but you can’t move the ‘Photos’ tab. In order to view all of your tabs, just click on the small drop down arrow to the right of your last tab. Once you’ve done that, all of your tabs are viewable and you can now edit the order. If you hover over the tabs, a small pencil will appear in the upper right hand corner. From there you will see ‘Swap position with:’ and you can select the tab to take its place. You can also edit the settings for the tab from this area as well. Now, one of the best features added to the new page is the ability to change the app’s icon – well, thumbnail actually. Before you had to deal with the icon the developer of the app chose – not anymore. The first thing you need to do is create an image (111px x 74px). Once you have that taken care of, click ‘Edit Settings’, then next to ‘Custom Tab Image’ click ‘Change’. From there you upload your custom image and you are good to go. No sweat! On weird thing though – The screen where you upload a new image is in a new tab or window, so after you’ve uploaded a new image, close that window or tab to get back to your edit screen, and click ‘Okay’ to finish it up. Pin to Top: This keeps the post up top like a ‘sticky’ post in a blog. Highlight: This makes your post span both columns of your timeline as oppose to one. 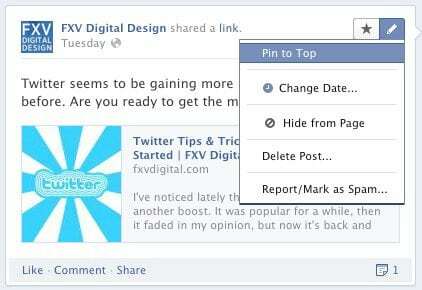 Change Date: This allows you to back date any posts. This definitely makes for interesting conversation now when posting new content. Keeping certain posts pinned to the top can be used for marketing your company, services or new products. It also is a wonderful tool for engaging fans and keeping them occupied on your page, so put some thought into what you are pinning – don’t just pin for pinning’s sake. Also take note that you can either pin or highlight, not both. In closing, make sure you take a few minutes and check out Facebook’s tutorial site on learning pages. They did a great job laying it out there and will help you understand more fully on how to get the most out of your new Facebook page.